The other night I spent some time streamlining our banking system. 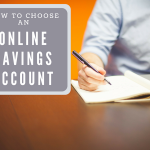 I’ve more or less settled on three core online savings accounts: ING Direct, Ally Bank, and Discover Bank to go along with our local bank accounts. Why these three? As many of you know, I love the convenience of ING Direct. They’re so good at so many things. Thus, we’re currently using ING as the “hub” of our online financial world. Unfortunately, ING Direct has fallen back a bit in terms of interest rates, so we’ve kept Ally and Discover around because they have a history of paying competitive rates. We’re currently getting 1.75% APY at Discover vs. 1.60% APY with Capital One 360. Now that I’ve identified the core pieces of our banking puzzle, the next step is to get them to work well together. 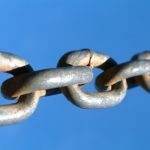 As things stood earlier this week, certain accounts were linked up in a daisy chain fashion, where money had to move from A to B before it could get to C.
In the interest of creating a more efficient system, I decided to go spend a few minutes systematically linking the accounts to one another. Stealing a page from my pal Jim’s book, I’ve drawn up a simplified financial network map to illustrate how things are configured. A few words about this map… The arrows indicate the direction of links. Some accounts (with double-headed arrows) are capable of pushing and pulling money from either side. In other cases, the arrow runs from the “master” account to the “servant” account. For example, I can log into ING Direct and push/pull money to/from our Bank of America checking account. I could configure our BofA checking account to access ING Direct, but BofA charges fees for certain types of external transactions initiated from their end, so I haven’t bothered. As you can see from the map, I can shuffle money around within BofA very easily. Once it’s in the checking account, it can be pulled out to any of our online savings accounts, and from there it can be shuffled back and forth at will. Our true financial map is, of course, considerably more complex than this. For example, Lending Club is set up to push/pull money to/from our checking account, and our Vanguard accounts have access to both our checking account and ING Direct. I also haven’t drawn in our automatic billpay, all of which originates from checking. Nonetheless, this should give you a pretty good picture of how we’ve set things up. What about you? How streamlined is your banking system? Chris: I initiate the transfer from the other bank. For example, if I want to move money from BofA to ING, I log into ING and “pull” the money in from there. Same goes for putting money back into BofA – I just “push” it from the outside bank. I used to say the same thing! Nickel, what do you do when you want to xfer money from your BofA checking to a high yield savings. Do you pay the $3 or have you found another way around it? Chris: We’ve been banking with BofA for years and have never had a problem with them. -You send mortgage payments by mail but your bank doesn’t apply them to your loan. Now you have to spend hours trying to fix their mistake. -Customer service gives you specific information on a pending transaction. A week later you learn that the information was completely false and makes you look like a liar. What risk are people taking by entrusting Bank of America with their money? FDIC ensured up to $250K, US Federal government “too big to fail,” and the largest consumer bank. Please help me understand the risk you see. I have been reading your site for years now and this post made me chuckle. I have something very similar mapped out in MS Visio…for 25 accounts. It may sound excessive; but over the years my individual pre-saving accounts, credit cards that I run all my bills through (paid off every month and cash back rewards) and diversity of investment vehicles have brought me to that number. Best part about the whole spiderweb of accounts, is everything is automated and tracked easily through Mint.com. The only way I can explain it to friends is with a diagram, but the whole concept behind it is maximizing rates and reducing costs. BofA is crap. They charge fees to transfer money externally and are just under AOL in the rankings for worse customer service ratings. Banking with them is a gamble because if and when you need their help, they will fail. Most people don’t realize the risk they are taking by entrusting this bank with their money. I stick with Ally Bank & Schwab Bank because of their refunded ATM fees and free checks (Schwab also doesn’t charge international transaction fees on debit card purchases when I’m abroad). As a local bank, for cash and check deposits I use BoA because their ATMs are the best around (at least here). If Ally or Schwab start accepting remote checking deposits I’ll probably dump BoA. Oh, and I have a membership at Vystar Credit union because it gets me a discount on Geico insurance and they have a free coin counting machine. 🙂 Love this post! The only online account I currently have active and funded is lending club. It is linked to my checking account. All of my credit card/utility/etc. bills are paid in a pull fashion where I initiate the transfer from the biller’s website. My bike loan is paid out of a savings account at the credit union, which is replenished monthly from my payroll deposit. The CU gives .25% rate discount with direct deposit. I have to manually initiate 4 bill payments per month, the rest are automatic withdrawal. I used smartypig for a while. That was where I saved the down-payment for my house. I had another goal going and then I needed money for repairs to my truck. Later on I switched to a reward checking account which pays ~4%, so I stopped using smartypig and I just handle all my savings goals on a spreadsheet. Alan: Yes, it was an account converted over from E-Trade Bank when Discover Bank and then left dormant for awhile. They apparently bumped up the rate to get our business, and it worked. Are you sure you’re getting 1.5% from Discover Bank? Their website shows 1.35%. Have you considered Smarty Pig as a savings option (SmartyPig.com)? Their rate will decrease to 1.75% in a few days, but no fees & you can move money in easily via multiple accounts. You are not required to use their recurring contribution option. Keep in mind that the rate decreases if you deposit in excess of $50,000 but you can have multiple accounts. Check it out. Mike, that’s pretty creative about the 1.01 to Time Warner Cable. I’m not quite sure it’s really in the “spirit” of the rules, but I guess the bank might not really mind because they get their transaction fee. And if TWC doesn’t care then I guess you’re on the up and up. Great idea to simplify the hoops they want you to jump through. You should really look into the rewards checking accounts. 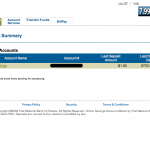 I am still earning 4% (up to $25,000) in my checking account with a local bank. Just have to get a either direct deposit or automatic debit (every time I do an ACH transfer from ING to my bank it counts as a auto-debit), make 12 debit card purchases a month (I pay $1.01 , 12 times to Time Warner Cable on my card) and get electronic statements. Takes about 10 minutes a month to earn 4%. Not that I’m in the habit of “chasing rates,” but when one account with a good chunk of change drops to below 1%, and another is paying 1.5%, you better believe I’m going to move it! Am I the only one who doesn’t give a flip about ING’s sub accounts? Sure they’re neat, but I can easily track what all my money is for. What do I need sub accounts for?? Jonathan: That arrow is single-ended because I haven’t connected it in the other direction. Or are you suggesting that I add that link between accounts? Like I said in the article, I haven’t done that because BofA charges a fee for pushing transfer out to externally-linked accounts, but the same isn’t true for ING pulling the money in from BofA. To be clear, the arrow doesn’t reflect the direction of money flow, but rather the direction of the link. 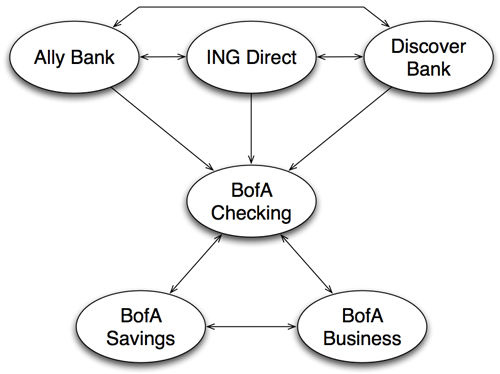 If I want to move money b/t ING and BofA, I initiate the transaction from the ING side of things. Update your arrow to be double ended for BOA and ING. I have stuck with ING, even with the current lower rates because I don’t want to be “chasing” rates. Perhaps in a year I will regret this, but it is so easy with ING is to have multiple sub accounts. I keep hoping rates will start to go up a bit, but after watching long term CD rates, I am not hopeful. Do you realize how CRAZY this post would have sounded 10 or 20 years ago?!?! Isn’t it great? Retirement accounts are also linked directly to one of the credit unions and set up on auto transfer – all I have to do is make sure there’s an extra $1,000 in that account at the beginning of each month 🙂 I really should re-do my payroll deposit so it automatically splits my paycheck to where I need/want the money…one of these days…. Financial network maps are DA BOMB!